[tweetmeme]According to InternetRetailer.com’s Top 500 Guide, Target.com is ranked as the 19th biggest ecommerce store on the Web today. From $756 million in 2004, Target’s web sales has grown to 1.153 billion in web sales in 2007. 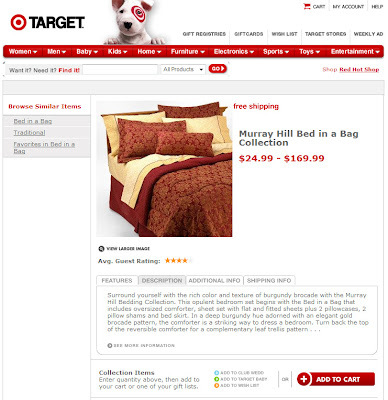 While we do not have access to Target.com’s analytics data (though InternetRetailer.com estimates that Target.com’s conversion rate is 1.9%), it is worth looking at the changes Target.com has made with their website to boost sales, with this post focusing on the product page. The predominantly white space next to the product in the 2005 version now contains product selection choices such as size and quantity. Visitors who know that they have found the product they want can easily order the item without the need to scroll the page down. Addition of product review from customers highlight the recent emphasis on community participation. The 4-tab product information section has been retained though Features and Description were merged (which makes perfect sense), while Additional Info and Shipping Info tabs were retained. A tab Guest Reviews was added. The shopping cart icon located at the topmost row of the page has been made more prominent. 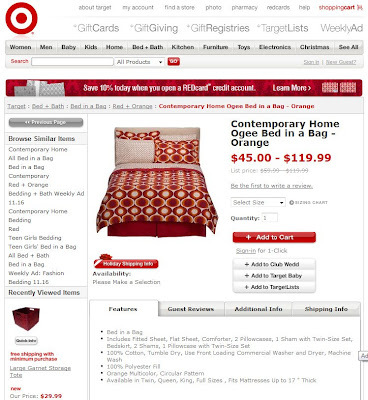 Whereas only the shopping cart graphic was red in the 2005 version, now the word “Shopping Cart” has been spelled out and both the text and graphic are now in a can’t miss red color. There’s nothing as “little changes” in web design. Sometimes slightly moving a page element or changing its color can boost the site’s conversion rate. Test these changes in your site and track whether the change has any impact on your conversion rate. would you be interested in a blogroll exchange?